We like satellite navigation devices, and not just because they are inherently a good idea for greener drivers. They all of course cut fuel use by helping to avoid wrong turns - sending you via an accurate and therefore hopefully less wasteful route. But more importantly they spell an end to fraught miles spent arguing with the other half over the need to stop and ask weird-looking strangers for directions. The current crop of satnavs are intent on becoming even more green, we are happy to report. The latest breed tend to boast a new option, alongside the quickest, shortest or easiest route you can now often select the most economical route. Given that average speed, the number of junctions and live traffic conditions will all affect your fuel consumption, it’s perfectly possible for the satnav to calculate a route that will use less of your pricey pump-juice – assuming you are willing to sacrifice a few minutes to the cause. The most economical route is not always the quickest, after all. 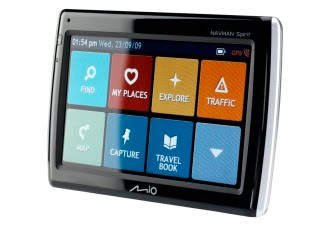 For this test we were kindly loaned a Mio Navman Spirit 500 (S505 model, with UK and Ireland maps), which can be found without much searching online for under £120. The unit boasts a large, 4.7-inch (120mm) touch-screen and is very slim (just 14mm thick) and very light (just 160g). You can slip it into a jacket pocket and genuinely not know it’s there. It comes with a simple but secure suction mount, and a computer disc of instructions which we roundly ignored. Our test unit shipped with a battery flatter than a Shrove-Tuesday snack, so we had to charge it before we could test it out. We happened to have a compatible mini-USB mains charger on hand, but failing that you’ll need to plug it into your car or a PC’s USB socket – the two cables for the latter are supplied. The screen proved bright and clear with excellent contrast and a good, wide viewing angle from side to side (less so from above and below). We were pleasantly surprised at how quickly a GPS lock was acquired – particularly as we were indoors and more than six feet from the nearest window at the time. Some modern satnavs boast features that we honestly can’t see the point of, but the Spirit 500 is relatively free of fripperies. It has a clear menu structure that’s easily accessible at any time – there’s a hardware button on the case that brings up the main menu screen. Setting up your home location and favourite places will cause few problems. We weren’t completely pleased with the options on offer – navigating by address proved to be deeply frustrating. Rather than asking for the city and then the road, the unit asks only for the road name, then (after a long pause) asks you to choose from all the streets with that name on the map. This fine if you’re bound for Obscurity Street, but no good if you’re trying to find Church Lane, the High Street or Mill Road. It’s a slow and, frankly, rubbish solution. At least the postcode address system is quick and accurate, as you’ll be using it a lot. Rather than asking what kind of route you want at each and every planning time, the Spirit 500 lets you choose between shortest, easiest, fastest and most economical routing in the main menu, and then applies your selection to all routes. We of course chose economy mode, but only after satisfying ourselves that calculated routes were indeed different under each of the various options. Clearly we were not able to test the routing modes exhaustively, but the eco mode looked like a good half-way house between fastest and shortest routes, as you might expect. In our tests we found that eco routing diverted us off motorways and onto A-roads with regularity, but fortunately this was not the recipe for frustration that you might expect – the live FM traffic information ensured we were never sent from a clear motorway onto a crowded single carriageway. Speed camera locations are preloaded and can be updated online, although we of course, cough, never speed so don’t need them. The default camera alert is a rather pleasant chime – much nicer than the harsh trumpeting that emerges by default from some rival satnavs. The audio cue is backed up by a very visible reminder on screen, a red-ringed speed-limit roundel telling you what number you’ll need to be under to avoid a flash and a fine. 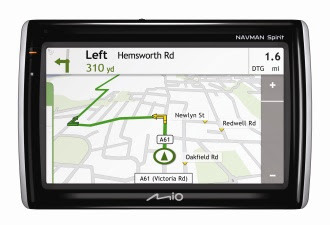 The default navigation screen is big on clarity but a little short on information – the top fifth of the screen shows upcoming junction information, the lower four-fifths a 3D scrolling map, and that’s it. A prod of the finger is needed to summon up a supplementary panel to the right of the map, showing distance to destination, remaining journey time, current speed, ETA and current time. Once selected, this panel stays put, more or less - from time to time it will scroll away back to its hiding place, without apparent rhyme or reason. Lane guidance for all junctions is good, while major junctions will see the map swept away in favour of large graphic with lane arrows, complete with helpful road-sign replicas. In our tests on familiar roads the routing seemed almost entirely sensible and quick to recalculate when we ignored its directions. The Spirit 500’s ability to hold onto GPS lock was remarkable – the unit threading us accurately through some tiny streets in the City of London flanked by towers of glass and steel. Our regular satnav unit (a relatively ancient TomTom) gives up and hides on these overshadowed roads. The only real minus point uncovered during our tests was poor sound quality. Spoken directions are delivered in a timely and accurate manner, with semi-intelligible street names, but they emerge from a speaker more weedy and tinny than a tin of weeds. Mio models further up the pecking order include an FM repeater, which allows you to tune your radio so that audio guidance comes through the stereo. This feature should be standard, because the S505 proved hard to hear in our eco-diesel test car (although it was OK in a whisper-quiet hybrid). Turning the wick up to 11 (yes, there really are 11 volume segments) meant we could hear even in the noisier car, but added an unpleasant distortion to the unit’s voice. It’s a shame, because speaker aside this is a lovely little product – well priced, mostly well designed and well specified. As long as you have ears like a bat, you won’t be disappointed.